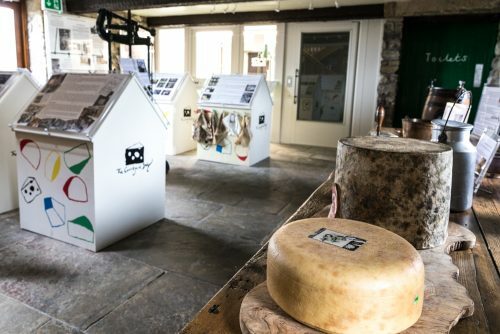 Alongside the award-winning shop and maturing room, The Courtyard Dairy offers a cosy café and a small informative museum which tells the story of farmhouse cheese and its history. This café is serious about cheese, with its cheese-maturing room and dining tables made from cheese-maturing boards. With first-class food ranging from hot, grilled raclette to bubbling fondue and rich toasties, any cheese lover will be delighted. Plus there are freshly-made cakes and scones, specialist coffee roasted each week, and a range of other beverages to enjoy. This is truly a great place to take pleasure in a quick snack or full meal. The café is licensed and features regular bespoke and unusual evening events: contact us to find out more. Sited right next to The Courtyard Dairy’s cheese-making room is an informative space with display panels and exhibits telling the history of cheese-making in Britain, how different cheeses are made and what makes farmhouse cheeses so unique – from pasteurisation to cloth-binding. Learn in detail a little more about what makes farmhouse cheese taste so special. This funding allowed The Courtyard Dairy to create its new museum area, café and cheese-make room in 2017, by grant funding for building works, new equipment and marketing material.